If you haven’t heard any buzz about N82 Tactical (pronounced Nate Squared Tactical, after the company founders) and their holster lineup, it could be the case that you don’t spend a lot of time perusing firearm websites or publications because the buzz is certainly going around. We first started checking out N82 Tactical holsters as our KelTec P11 project was wrapping up and we were looking for carry options. We had heard about them through our friends over at the Tac Daddy Live show, but didn’t know much about them. Obviously it was time to learn more, so we contacted Nate B. who, along with Nate J., is one of the company’s two namesake Nates. N82 Tactical offers three styles of IWB holsters for a huge variety of handguns. The general construction of each style is roughly the same for the backing/pad with the main differences being in the actual holster part and the belt clip attachment. Shortly after talking to Nate, he had P11 holster in each of their three styles headed to GunLink HQ. 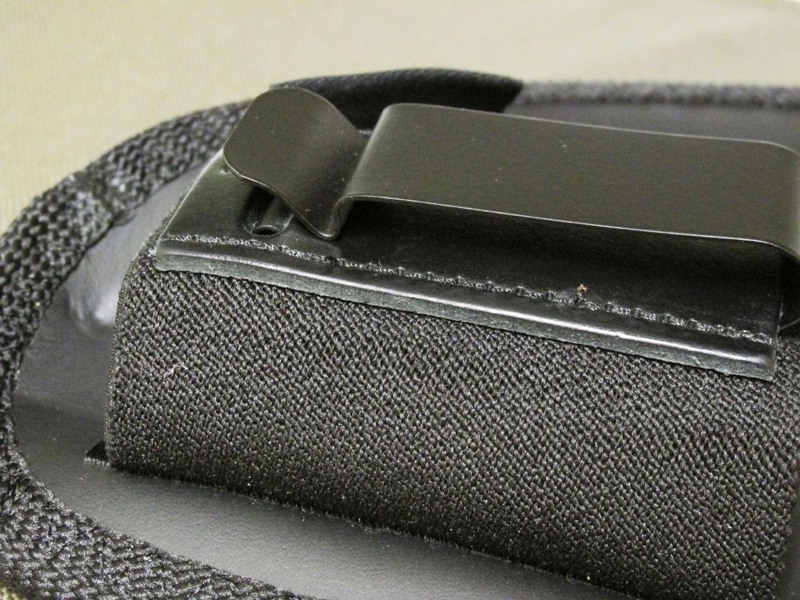 The secret to the comfort of N82 holsters is in the construction of the backing pad. 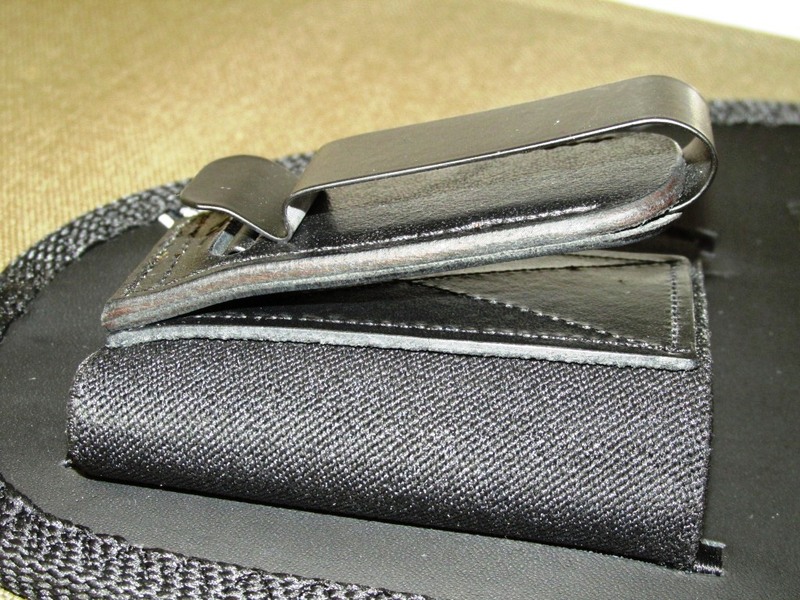 The backing of all N82 holsters consists of the same three layers. The outside surface, the surface that comes into contact with your firearm, is oil tanned leather. This provides a safe contact surface that won’t damage the finish of your firearm but is still durable. The inside surface, the side against your body, is a layer of soft suede that is comfortable and allows your skin to breathe. The nap of the suede provides extra friction against your skin or undergarments, which helps to keep the holster in place during normal wear or firearm presentation. The extra friction, combined with the pressure from your waistband, also helps offset a portion of the firearm’s weight and allows only one belt clip to be used. Sandwiched between these two outer layers is a layer of neoprene – the stuff that wetsuits are made out of. This layer not only provides a barrier between sweat and your firearm but also provides a cushion to prevent sharp edges and corners from digging in to your body. The Original N82 holster is the product of Nate and Nate’s 2009 phone conversation about the lack of a comfortable all day, every day CCW holster on the market. After putting their heads together and working up a few prototypes, the N82 Original was born. On this model, the firearm is attached to the holster pad with a swath of elastic material. I was a little skeptical at the notion of strapping my carry gun on by means of an elastic band but that skepticism was alleviated once I tried it out. The heavy duty provides a snug, form-fitting grip that securely holds the pistol in place. Sewn to the elastic material by way of its leather housing is the single metal belt clip. The N82 Tactical Original model has an MSRP of $39.95. The Original Tuckable model is nearly identical in construction to the Original model with the exception of how the belt clip attaches. Rather than the metal belt clip’s leather housing being sewn directly to the elastic material, the clip of this model instead has its leather housing double stitched to the bottom of a second leather tab which is then sewn to the heavy duty elastic. This allows the wearer to tuck their shirt tail into their trousers all the way around, with the shirt between the two leather tabs of the holster clip. 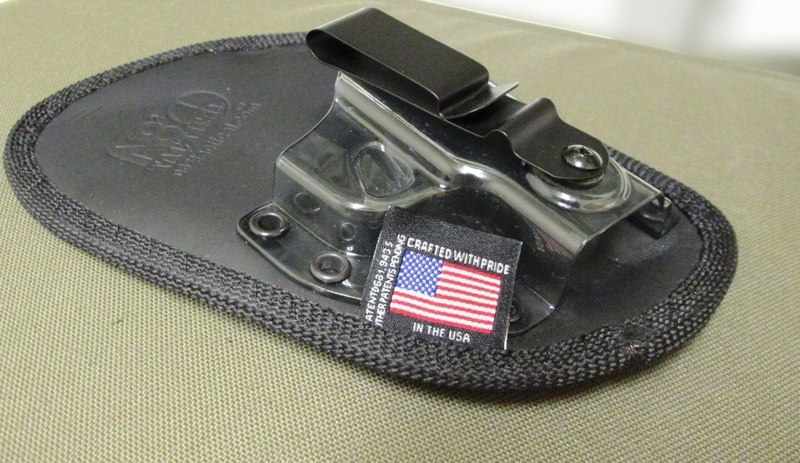 The N82 Tactical Original Tuckable model has an MSRP of $59.95. The top-of-the-line Professional model strays a bit further from the original line. While the comfortable holster backing remains the same, instead of heavy duty elastic the firearm is held in a strong custom-formed polycarbonate housing that is riveted to the oil-tanned leather layer. This not only allows a great looking custom fit for your carry pistol, it also allows for one-handed re-holstering without removing the holster as well as introducing a retention system for the firearm. Plus, since the powder-coated metal belt clip is attached with a screw on this model, the wearer can adjust the cant to their liking by loosening the screw, positioning it to their desired angle and re-tightening the screw. MSRP for the N82 Tactical Professional model is $69.95. We put each of the holsters through its paces, paying attention to comfort, concealability and ease of use. This included wearing the holster while driving across several states, going for long walks (thanks for the recent 70+ degree days, Mother Nature), vegging out on the couch and, since they mention it in their pitch, even napping in it. Throughout all of this, we were quite pleased with each of the holsters – some even more than others. Ease of use for all three models gets top marks. It really could not get much simpler or faster to put on the holster and get it where you want it to be. With a footprint only slightly larger than the firearm itself and a single belt clip, putting the holster on is as simple as pulling out your waistband and tucking it in. Since the belt clip is open at the bottom, the holster doesn’t have to go on while your belt is getting threaded through the loops. In fact, for the Original and Original Tuckable models, a belt probably isn’t even necessary since the suede back and belt clip seem to be plenty to keep the holster in place when the pistol is drawn. I even wore this model around the house quite a bit in gym shorts with no problems. The unique retention system of the professional model, however, probably prevent it from being worn without a belt or with lighter garments. To draw the pistol from this model, the wearer must grip the pistol and slightly turn it inward toward their body before drawing – something that might not work as well with a looser waistband or a solid carry belt to keep the holster in place. Drawing from any of the three holsters was also simple and, for the most part, natural. The twist-release retention system of the Professional model took a couple of draws to get the hang of but, after that, it happened quite naturally without thinking about it. The backing pad of the holsters covers the entire outline of the pistol (and then some), including all of the area around the grip – that is to say that it does not have what is frequently called a “combat cut” on some holsters. This did not pose a problem given the flexibility of the backing material which had plenty of “give” to allow the wearer’s fingers to wrap full around the grip before drawing. Concealability was more than acceptable for all models, although the Professional model seemed to shine a bit brighter here thanks to its slightly lower ride height. The N82 are regular IWB holsters, as opposed to “deep cover” holsters. The grip of the pistol is fully exposed on all models although the Professional seemed to keep the front of the grip right at the top of the waistband while the Original models kept the grip about 1/4-1/2″ above the top of the waistband. A little bit of extra width does come from the fact that the single belt clip sits right on top of the pistol giving the wearer a sandwich of suede, neoprene, leather, pistol, elastic or polycarbonate and the belt clip all stacked at a single point. In jeans and a t-shirt, the P-11 concealed fine, printing slightly in the Original models. With an outer shirt or jacket, they completely disappeared. With a shirt tucked in over the Original Tuckable model, the entire contraption basically vanishes with only a very slight bulge on the hip. Comfort also got top marks for all holsters with no discernible difference between the models with elastic or polycarbonate attachments. The 3-layer backing kept any pointy bits from digging in while wearing it and kept the rough-textured grip from abrading skin. Whether it was spending multiple half-days in a car, working around the office, going for long sweaty hikes or binge-watching Netflix shows on the couch, the holsters started off comfortable right out of the box and stayed comfortable. Yes, even comfortable enough to doze off in front of the television while wearing it. The full line of innovative N82 Tactical holsters were impressive. Made in the USA, sold at reasonable prices and shipped when you order (versus waiting weeks), they certainly seem to be a bargain. They are comfortable from the moment you take it out of the box and do not require hours, days or weeks of “break in” to get them fitted to your body. Of the three models, the Professional rose to the top for me thanks to its lower ride height, retention and ease of re-holstering. The Original models certainly have their places though, especially with summer coming up and bringing with it the prospect of lighter clothing. Visit the N82 Tactical website to learn more about all three models and to order online. The important things in holsters is that it should be comfortable to wear and fits the gun well. Not to mention the security it gives. This is a pretty good review. Thanks for sharing!